The first set of kitchen gifts was from my daughter, Shelby. She has become quite a seamstress and as you will see later, it is her grandmother who deserves some of the credit for that. She not only carried that gene over to Shelby, but spent three summers taking Shelby and a friend, Rachel, to sewing camp when they were girls. 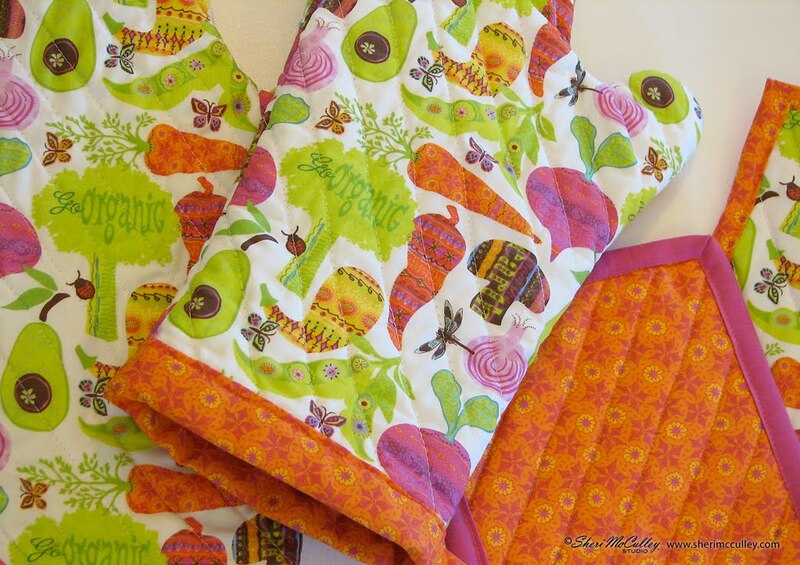 Shelby and her dad amazed me with the very secretive gift of personalized, one of a kind oven mitts, hot pads and tea towel with fabric that they had specially made from some of my designs. They were able to have the fabric printed at Spoonflower, then Shelby researched and began sewing her very fist quilted fabrics into the over mitts and hot pads. I’m just in awe and I absolutely love the choices she made for the pieces. Now she and I are wanting to make matching retro styled aprons to complete the ensemble. Yes, I am one of those very proud, bragging moms right now. The next set of handmade gifts were from my mom. 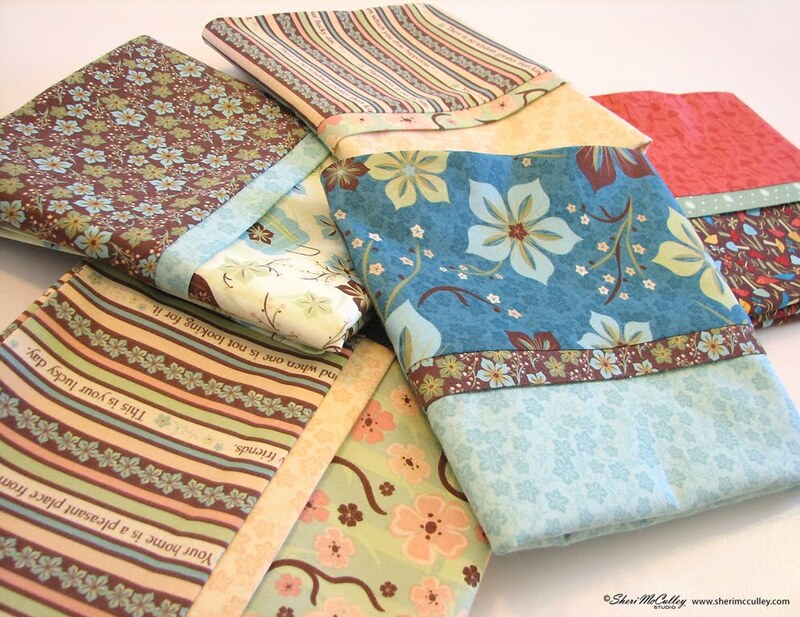 She has also been Mrs. Clausing quite a bit the last few weeks and the entire family was lucky enough to be the recipients of the detailed and lovely pillowcases, each thoughtfully designed for each family member. Mom claims these were a breeze to sew, I can’t image that to be true. :) They all have three different fabrics per case and each is nearly too beautiful to use, but I promised her that we will. 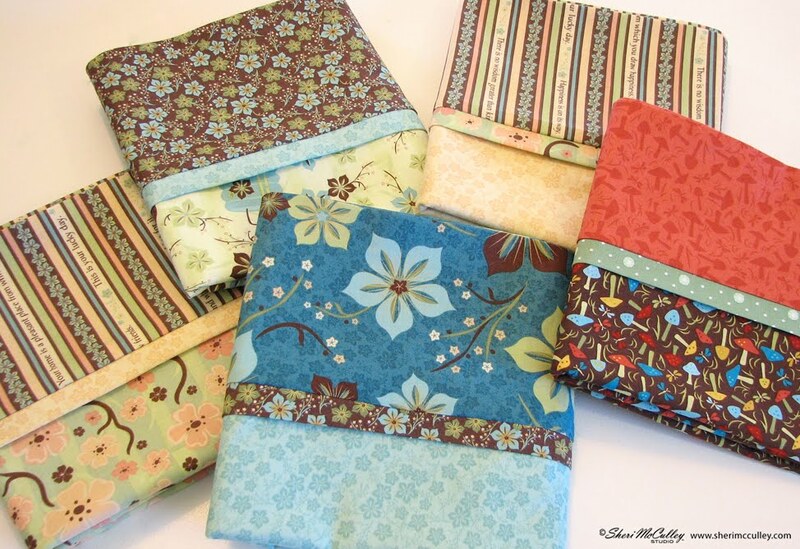 All of the fabrics my mom used for the pillowcases were designed and produced for Northcott fabrics, some from the Chinese Takeout collection, some from the 12 Joys of Christmas collection and a few from the Child’s Play with Nate collection, both cotton and flannel. I believe some of those prints might still be available (try eBay and etsy). 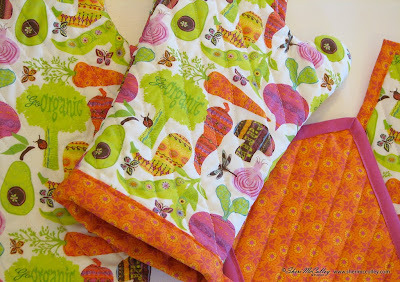 Now my mom is starting an apron project. She makes aprons to take on her mission trips and one is coming up in just a few weeks, so my Mrs. Claus from the midwest will not be taking a break now that Christmas is past. The third set of gifts was actually given to me a few months before Christmas, as I see my friend, Jackie only a few times a year, and those dates never fall around Christmastime. She is an amazing quilter, truly capturing fabric, texture, color and design into beautiful pieces of art. This is something I admire, as it is so different from the art I design and make in my line of work. 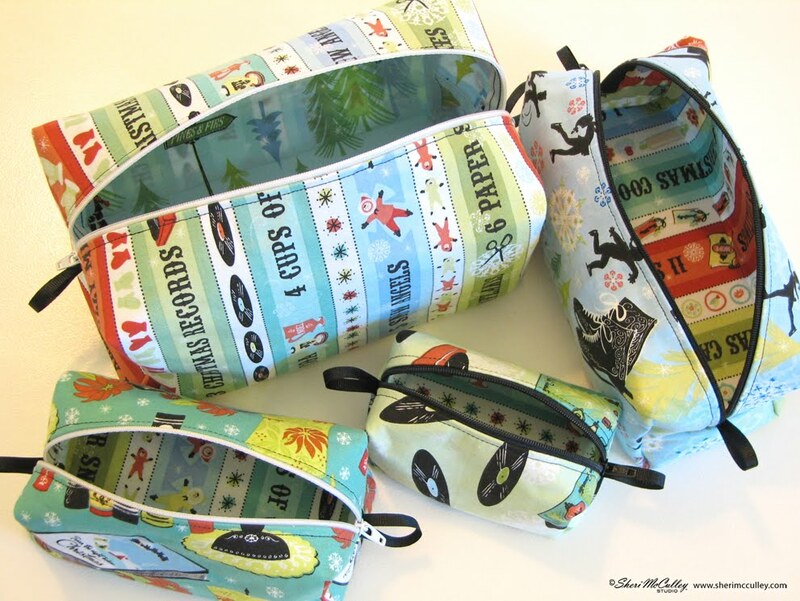 This gift however, was not quilted, it is a set of four nesting pouches, and they are adorable. The largest pouch is about 4" by 8" and the smallest is a mere 2" by 4" and they all nest together perfectly. 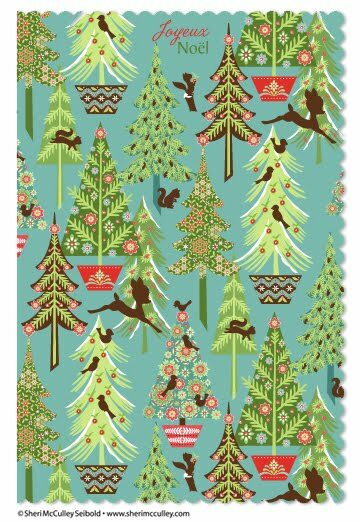 Jackie used the 12 Joys of Christmas fabrics: the stripe, the skaters, the storybooks, the records and the Christmas tree print. 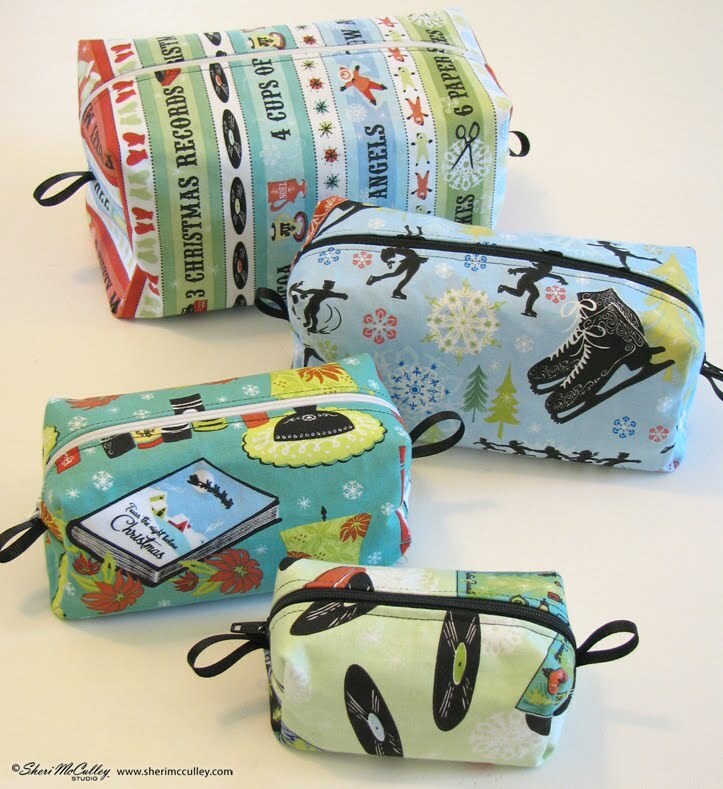 Each pouch has lining of a coordinating print and of course zippers and pulls on each. They are absolutely perfectly constructed. 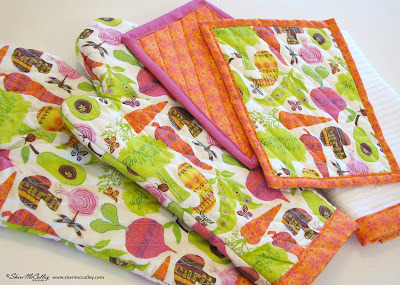 Once again, Jackie very modestly acted as if these were simple little projects to sew. I will humbly disagree and will treasure them always. I have another treasured gift that I was give a few years ago, bearing the Swell Noel fabric on a truly adorable kitchen apron. I will share that gift from the heart and hand in a future post, as it will always be forever treasured by me and needs to be shared with you. While these gifts were not gold, frankincense and myrrh, they are better than gold to me and will always be handled with the loving care that I know each giver used while creating them. It’s that time of year when kitchens in many homes are filled with cooks making candies and baked goods to share for the holidays. 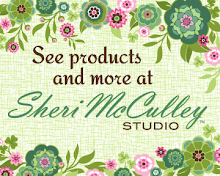 Most of those same homes also have craft and sewing rooms with handcrafted projects being finished up and wrapped into wonderful gifts just in time for Christmas. There is something endearing about a handmade gift. Not just because it is made with love and care, and with detailed thought for the recipient, but because it is one of a kind. It can’t be found in stores or purchased online. Each hand stitch of embroidery is individual, each chocolate drizzle is unique and each handmade gift is wrapped and tied with ribbon chosen for just that gift. 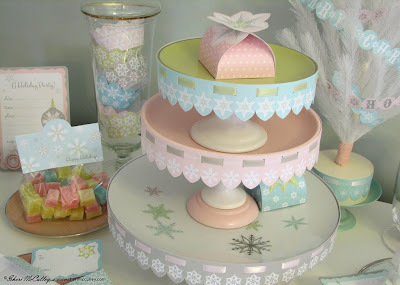 I have also been handcrafting this season with the Holiday Frosting collection at Lettering Delights. I have made tiny envelopes for gift cards. I have made treat tents for bagged candies. 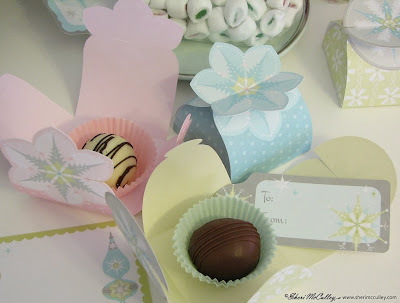 I have made individual truffle boxes for chocolate treats. 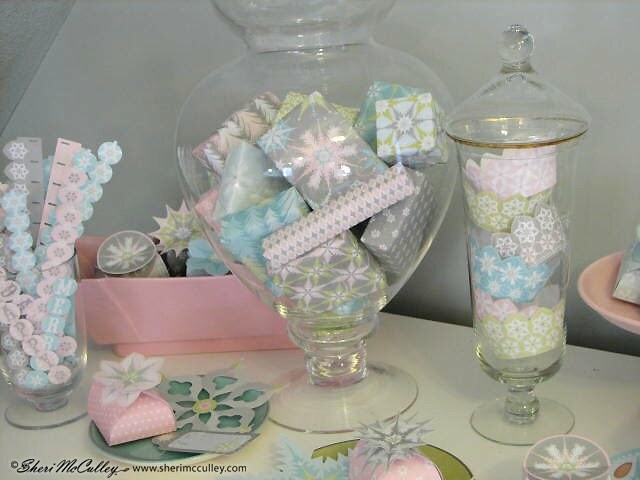 And I have finished it up with borders as mini Christmas tree garland and pedestal wraps. 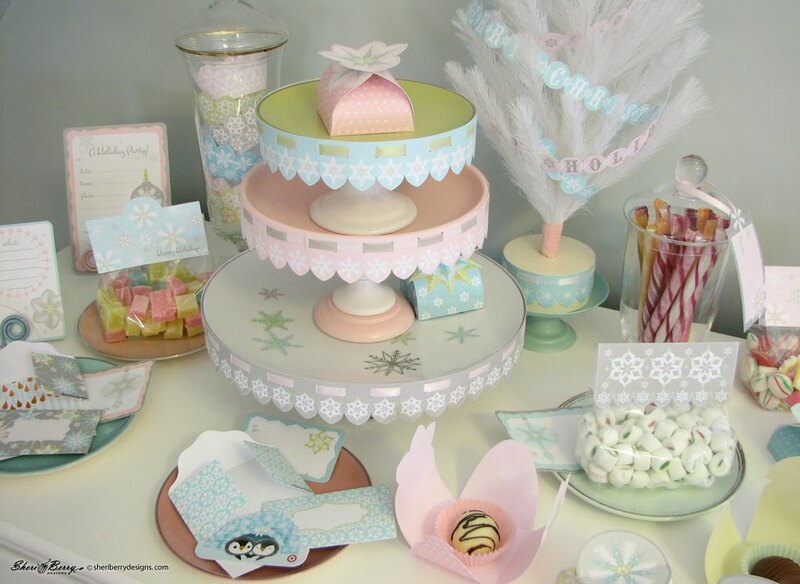 While I can’t tell you that I have embroidered or knitted or sewn gifts for each family member, or that I have made wonderful homemade candies, I have made the frosting to cover a gift, or tree or tabletop. 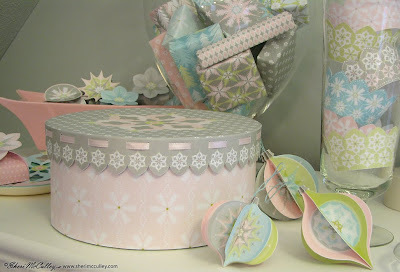 It is my favorite gift to give; to make handmade creations from paper and it is the best gift I can give from the heart. 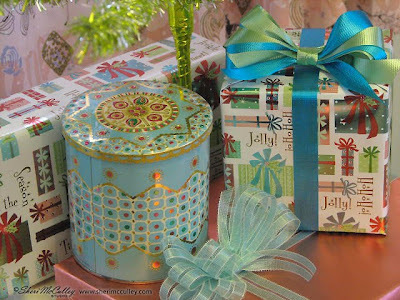 So, if you have made all of your wonderful gifts, but need just the right tag, or wrapping, or box to finish off the gifts you can put a little Holiday Frosting on and personalize them yourself for those you love. Because everything is just a little bit sweeter with frosting. Have a blessed and joyous holiday season. Oh Christmas Tree, Pink Christmas Tree! 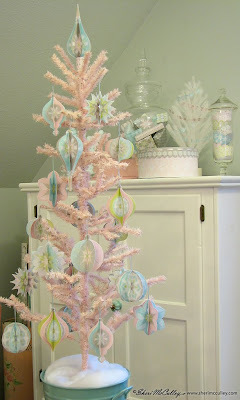 My pink Christmas tree has been in waiting for the last few years for the perfect ornaments to hang from its branches. Well, this year is its time, and the handmade ornaments are from my Holiday Frosting collection with Lettering Delights. 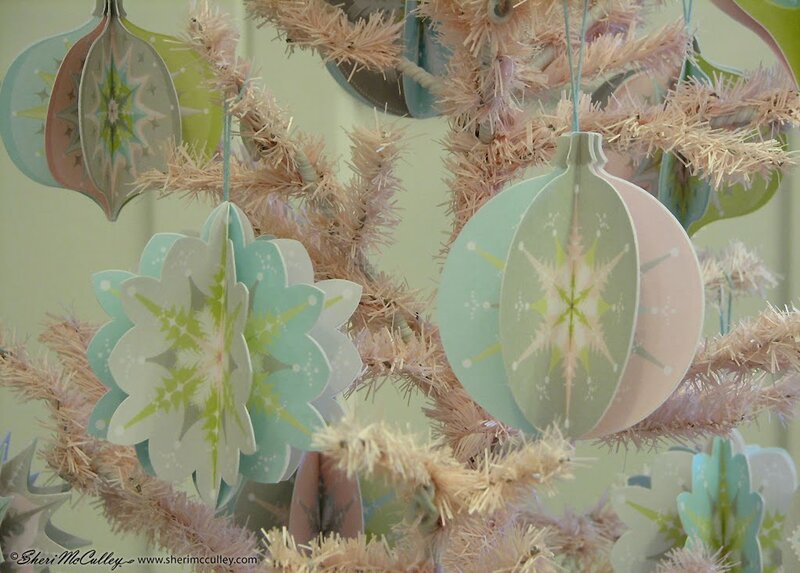 The ornaments are made from the Holiday Frosting Ornaments and Holiday Frosting Snowflakes from the print and cut files available now at LD. 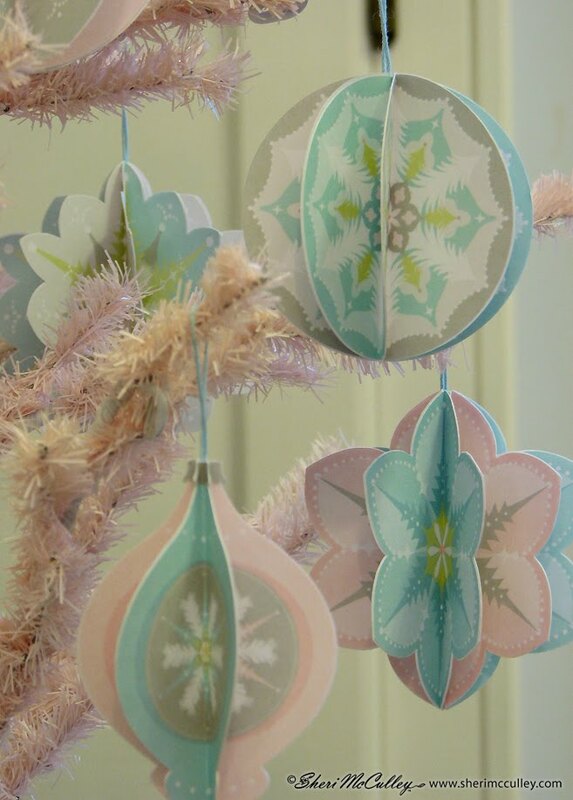 These ornaments were not complicated to make, and with enough time to get them done for Christmas, the little tree has been covered with the softness of pink, aqua, gray and moss to match my studio decor. It is almost as though the studio was designed for the tree. I have an idea this little Charlie Brown, gone pink, tree will grace the studio well into January. The collection was designed to warm the heart during those chilly winter days, so keeping these frosted flakes around for a while will be fine with me. 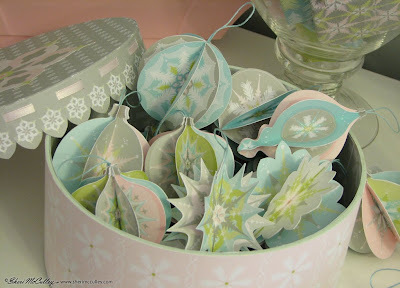 In addition to the ornaments I wanted a matching box to store them in while not in use. I found a perfect hat box to cover. 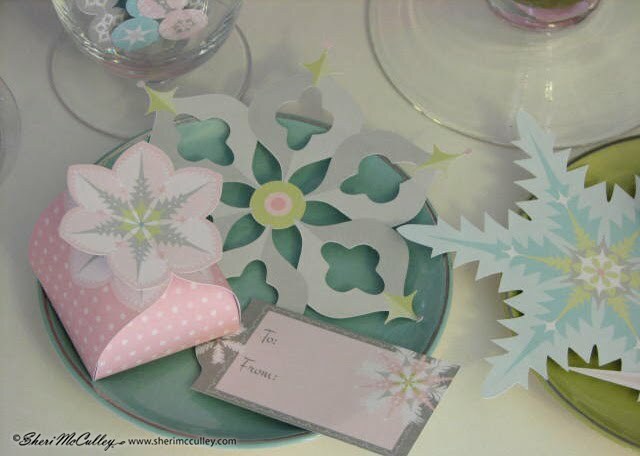 I then used some of the papers, the gray border with notches and one additional snowflake from the collection to top off the box. Again, not a complicated task at all; just a little time and patience, glue, a pink ribbon to thread through the border around the lid, and printed and cut papers from the LD files. 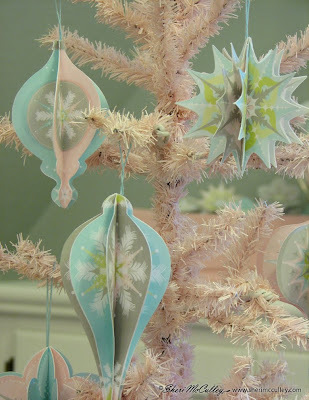 Each ornament was made with eight equal sides (one design, but multiple colors) of a printed shape (a snowflake or an ornament). In other words to make these, you will need to print out eight pieces of an ornament, all the same size and whatever color combination you prefer. 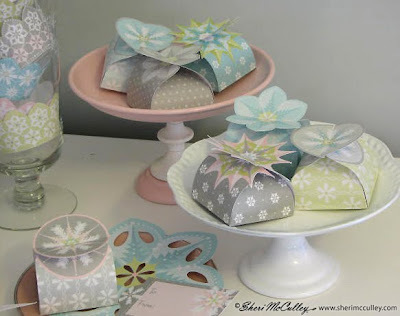 Once all of the pieces are cut out, you will fold each piece in half (facing itself), glue one half to another piece at its vertical center and the other half to another piece on the opposite size at its vertical center, until you have all eight sides glued together. However, before you have glued the final pieces together, use about a six to eight inch ribbon or string folded in half and also glued into the center of the ornament (with the loop up), so that it has a hanger. I actually glued the hanger (aqua string) between the first two pieces at the beginning to make sure I had not forget to attach it when completing the ornament. The paper used for the ornaments is a 90lb. bright white index stock. 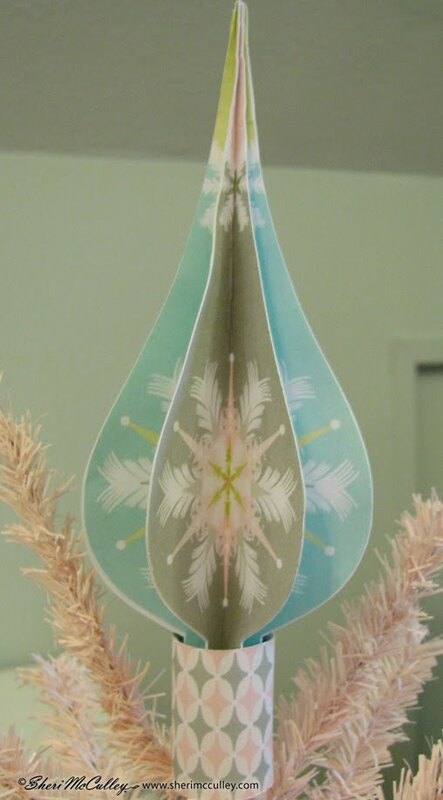 The tree topper was also made just like the ornaments, however I simply cut a strip of one of the patterned papers to use as its base to slip over the tip of the tree. This strip was about eight inches long and an inch and a half wide. I rolled it into a tube that would cover the tip of the tree and the end of the ornament. 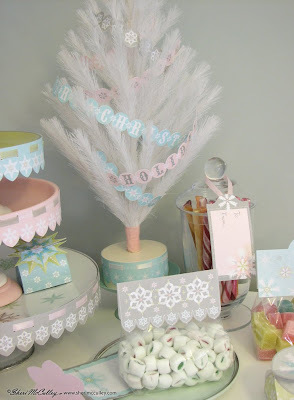 I then glued the strip to itself to tighten the tube around both the tree and ornament. 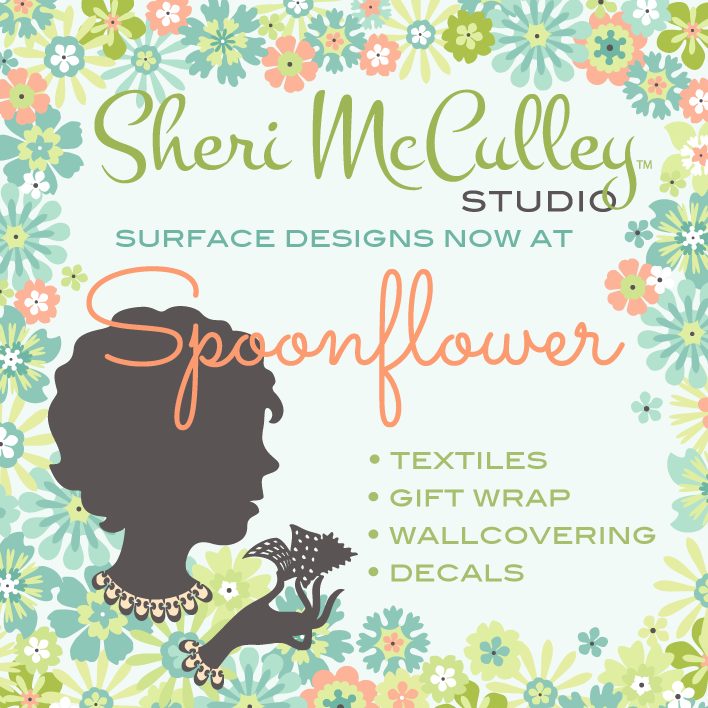 Now my studio is starting to not only feel like the season, but it is doing so in a style that fits the studio decor. It’s beginning to look a lot like Christmas. 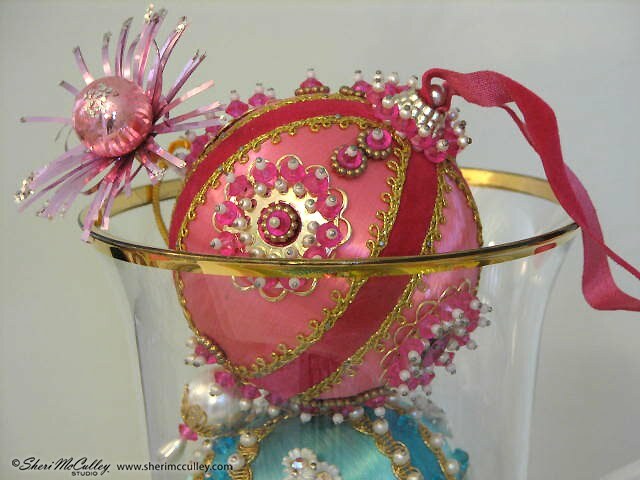 If you would like to make your own berry soft ornaments, please click on my Sheri’s Creations sign at the top, right side of my blog or click here to see the entire Holiday Frosting collection in both the graphics and print and cut sets available now at LD. It is time to start wrapping the Christmas presents that have been stashed away in the closet. This year the wrapping process is a little more exciting. 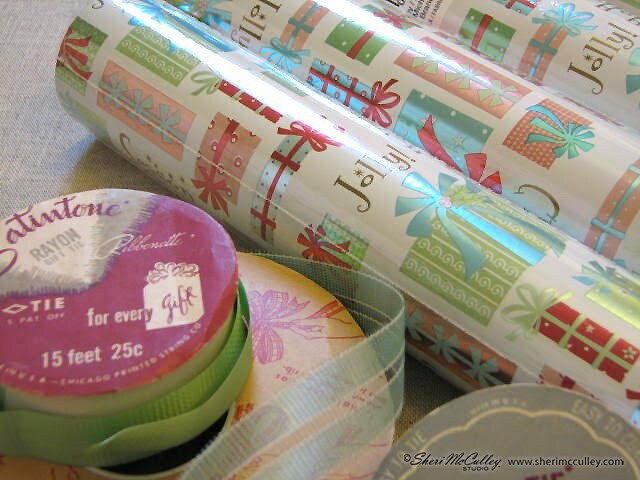 I was able to get the Swell Noel paper at Michaels and it is kind of fun to finally be wrapping gifts with real Sheri paper, rather than designed papers from the printer. And bonus, this wrap is full of foil, shimmering and shining like the lights on the tree. Sadly, my printer is not yet capable of printing foil or metallic inks on rolls of paper. Since the Swell Noel wrap is a retro style design, the only ribbons worthy are from vintage spools with names like Sasheen, Satintone and Super Lustro. And they are just that, adding a bit more gleam to the gifts. The only thing missing to finish off this mid-century look are the Shiny Brite ornaments to hang on the tree. Not to worry, I have a supply on hand. This photo is sharing a few of my latest ornament finds, straight from the late sixties, via a few current thrift shops and estate sales. They were all the rage when everyone started jumping on the handmade Christmas bandwagon, but with a twist. These ornaments were from the “everyone can craft” kits of the era, complete with satin ornament, ribbon, gold lace, sequins, beads, pearls, and about a thousand tiny straight pins to hold them all together. 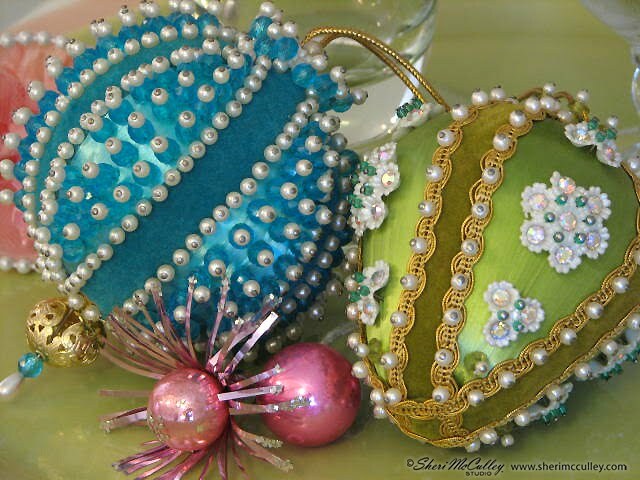 My second hand ornaments seem to have shed a few pins and pearls along the way, but they still make me smile and remind me of those years as a child when I could hardly wait for Christmas, when all the world was aglow. Merry Christmas and may this season be a shiny and bright one for each of you. Let’s get to the Frosting! 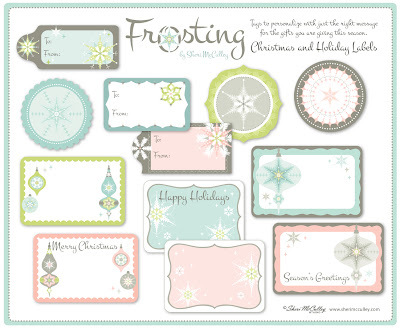 The Holiday Frosting collection has arrived at Lettering Delights and the selection should provide you with many options to add that touch of frosting to all of your holiday crafts, decorating and gifts. You can click on my LD sign at the right to go directly to the collection. This collection is for graphics only, but another will be coming out early next week for those of you who love to print and cut your projects. You will want to check in again at the beginning of the week to learn more about even more frosted toppings. There are even a few more sets to choose from in the print/cut collection, and you will see a peek into those on the photos posted here. The Holiday Frosting graphics collection includes: alphabet, borders, labels and tags, papers, cupcake wrappers, sparkling ornaments and intricate snowflakes. I have made this collection from two soft and lovely colorways and intertwined them into one beautiful set of winter grays and blushed pinks along with breezy blues and snowdrop greens. 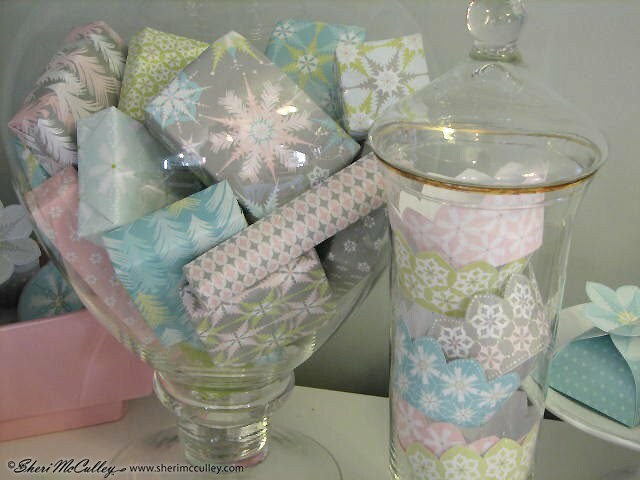 In the photo above are many of the papers used to wrap tiny gifts and cupcake wrappers are stacked in the glass at the right. In the photo above you will see many dainty borders for embellishing and adding that finishing touch. The photo above shows a few of the box designs that will be out next week with the print/cut collection. These boxes are great for housing your homemade confections, and with a personalized label, the perfect gift to give from the heart. 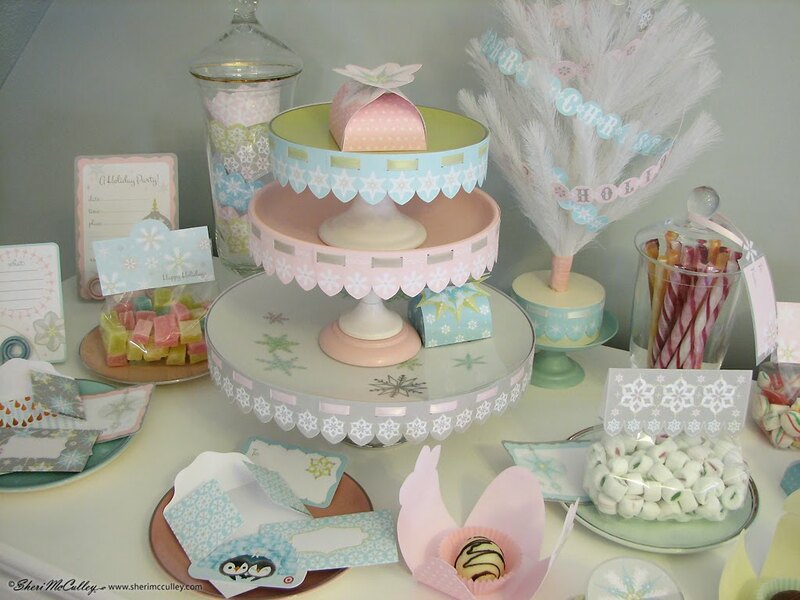 With all of the embellishing the Holiday Frosting collection provides, there is only one thing missing to top off your holiday gift giving, and that is a Christmas card to share with family and friends. 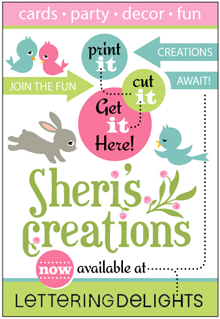 I have made a card design (in the pinks and in the blues) that you can print. It is made to fit an A7 envelope (5.25 x 7.25). You can keep the phrase, season’s greetings, or use that space as a border to put a photo in, the photo size is about a 3 x 5, if you print your cards at 100%. Just print on cardstock, trim on the trim guides and fold in the middle to create your personal holiday cards and write your own personal message inside. 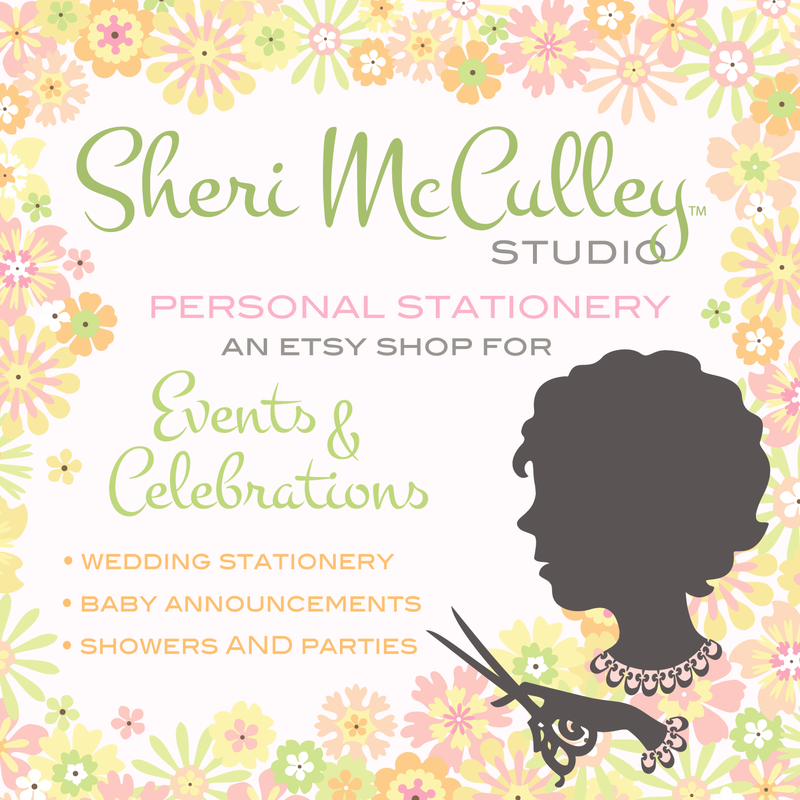 To download the greeting cards, go to my U-Pick button at the right and choose Frosting Card Pink or Frosting Card Blue from the Frosting folder. 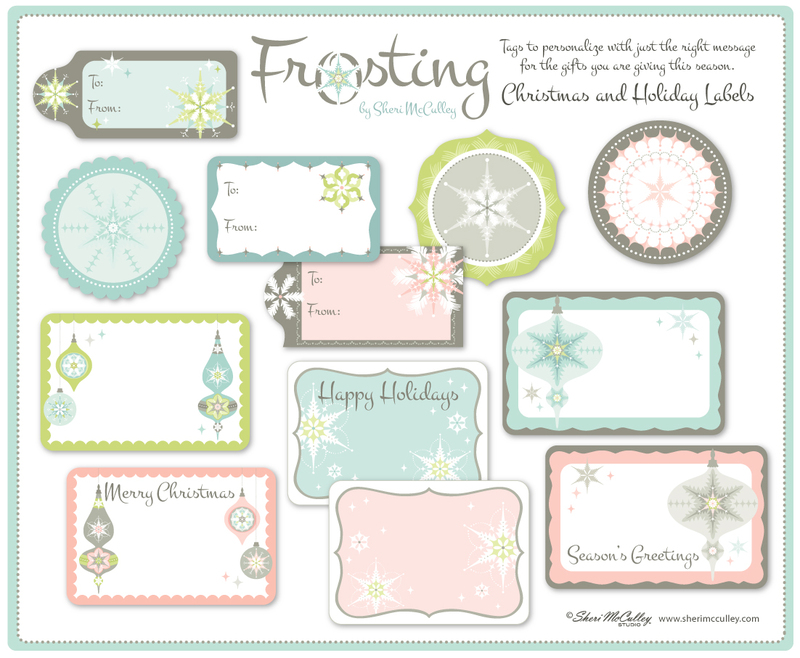 To get the Holiday Frosting individual sets or bundle from LD go to my Lettering Delights sign at the top, right or click here. If you use the coupon code “snowflake” you will get an additional $5 off when purchasing $20 or more, so get to LD and find that frosting to top off the season. 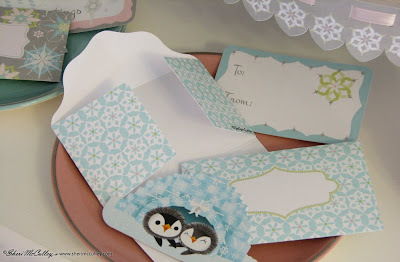 The good news is it doesn’t matter where your town is because you should be able to get these Frosting labels and many other Frosting items by the end of the week on Lettering Delights. 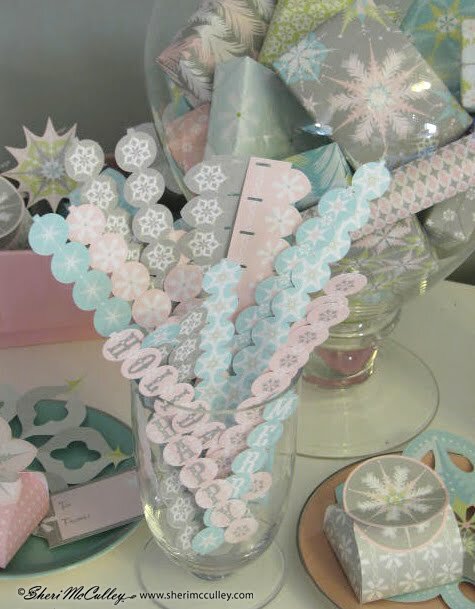 This is just a peek into the many frosted images you will have to choose from in order to finish up your holiday and party decor for the Christmas season. 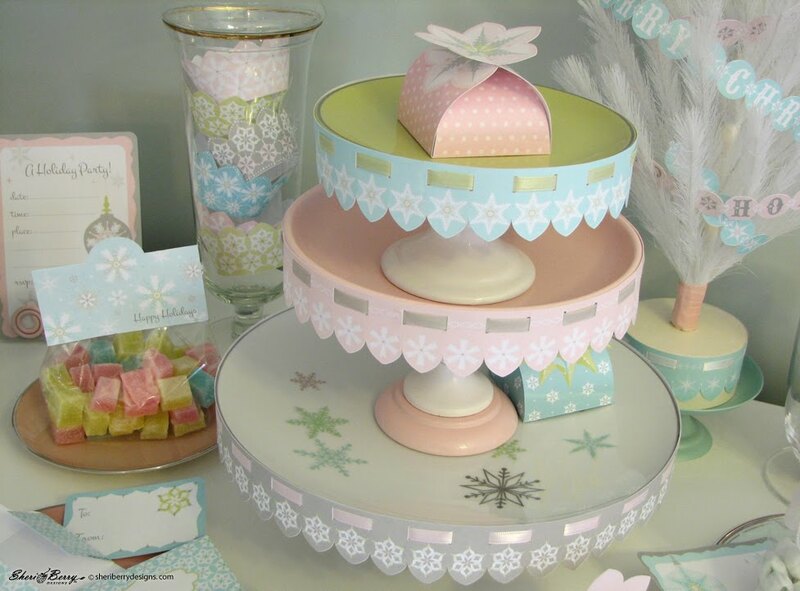 This collection has a muted softness to reflect the season, just after the first snowfall has covered the ground, or the window panes have been vignetted with crystalized flakes. It says no more, it says no less, but it does say it is the frosting to top off your holiday cheer. I will let you know exactly when you can find this classic topping for your holiday crafts and decor on Lettering Delights, so you can be of good cheer! A Holiday Greeting to the French! To my European friends, I have a search on for you as well. I have 48 holiday/seasonal cards (each with a different design) that should be out in France and other European countries by now. They are with the French card company “Groupe Editor Gifts and Cards.” On the back of each card you will see my logo with a gingerbread man, as well as copy that reads “Pain d’épice” (spice bread). 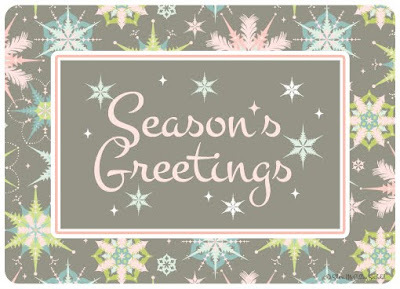 Here is a sample of one of the cards. 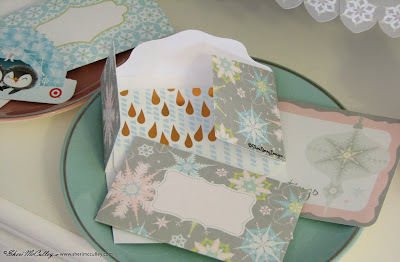 All of the card designs have scalloped edges and are embellished with either gold foil or glitter. 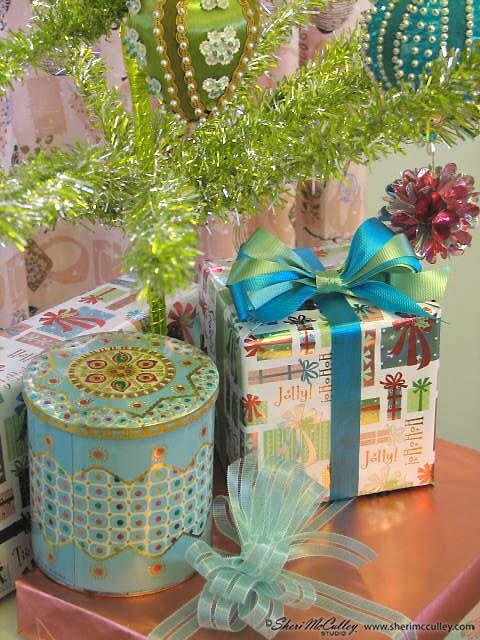 So, shimmer and shine this holiday season ~ Joyeux Noel to all! Gift wrap for Christmas is in hiding! 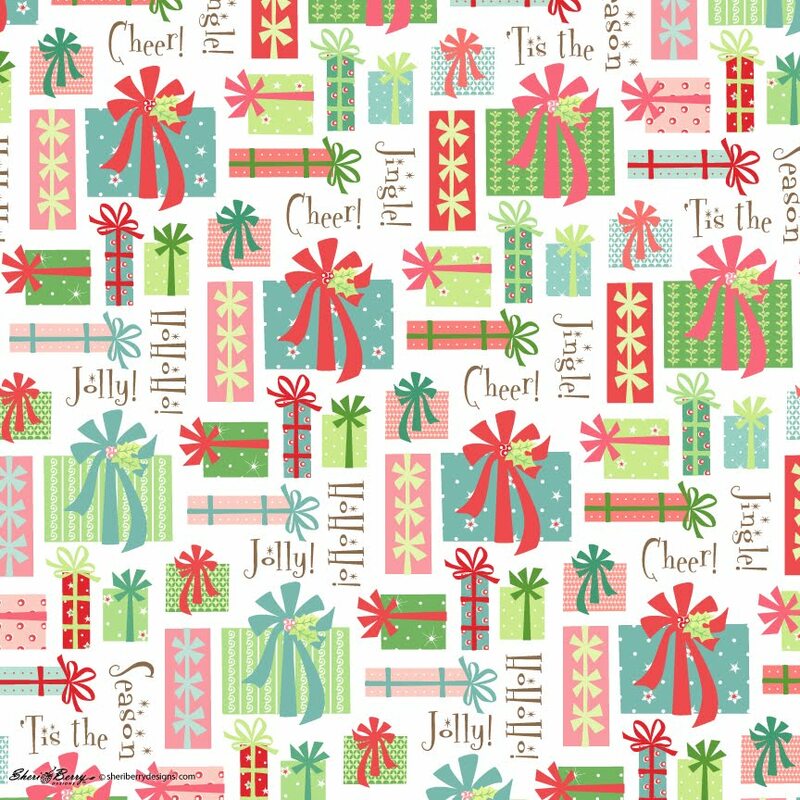 Hello all, I am looking for the Christmas gift wrap based on this pattern (above) that I designed in the Swell Noel collection. 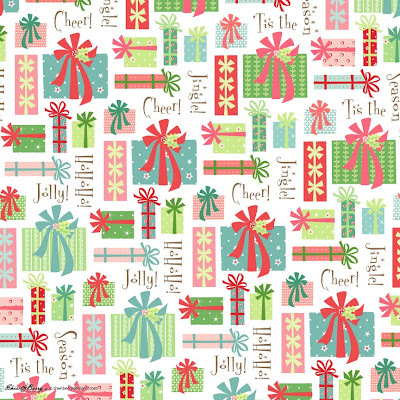 I have been told that the wrapping paper is now in Michaels Craft Stores for this holiday season, but I cannot find it in the stores in my area. It might be sold alone, or in a roll pack (maybe of four, I don’t know). However, if any of you happen onto it in the next few weeks I’ love to know where in the country (US or Canada) and in which Michaels stores you found it in. On another happy note, I do think my Frosting collection will be available for Lettering Delights hopefully by end of next week or so. I will keep you updated and will of course blog about the variety of art, decor and holiday projects that can be done with the sets made for LD as soon as they are on that website. More on that as I have it available.